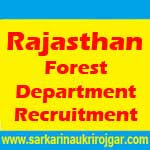 Rajasthan Forest Department Recruitment 2015 – 1473 Forest Guard (Non TSP Area) Posts:- Rajasthan Forest Department, Chief Conservator of Forest, Jaipur has published latest notification for filling up 1473 posts of Forest Guard for Non-TSP Area. Desirous & eligible candidates can apply online from 16/11/2015 to 01/12/2015. Age Limit as on 01/01/2016. Educational Qualification: Secondary/ Equivalent from any Recognized Board. Application Procedure: Eligible candidates can apply online through the website http://www.rajforest.nic.in from 16/11/2015 to 01/12/2015. Rajasthan Forest Department, Chief Conservator of Forest, Jaipur has published latest notification for filling up 327 posts of Forest Guard for TSP Area. Desirous & eligible candidates can apply online from 16/11/2015 to 01/12/2015. Rajasthan Forest Department, Chief Conservator of Forest, Jaipur has published latest notification for filling up 193 post of Forester for Non-TSP Area. Desirous & eligible candidates may apply online from 16/11/2015 to 01/12/2015. Educational Qualification: Senior Secondary (10+2) OR Equivalent. Rajasthan Forest Department, Chief Conservator of Forest, Jaipur has published latest notification for filling up 45 post of Forester for TSP Area. Desirous & eligible candidates may apply online from 16/11/2015 to 01/12/2015. Subscribe our free job alert mail for Rajasthan Forest Department Recruitment 2015.